 At this point the boy performed a dance, eliciting from Socrates the remark, "Did you notice that, handsome as the boy is, he appears even handsomer in the poses of the dance than when he is at rest?" "It looks to me," said Charmides, "as if you were puffing the dancing-master." "Assuredly," replied Socrates; "and I remarked something else, too,—that no part of his body was idle during the dance, but neck, legs, and hands were all active together. And that is the way a person must dance who intends to increase the suppleness of his body. And for myself," he continued, addressing the Syracusan, "I should be delighted to learn the figures from you." "What use will you make of them?" the other asked. "I will dance, by Zeus." This raised a general laugh; but Socrates, with a perfectly grave expression on his face, said: "You are laughing at me, are you? Is it because I want to exercise to better my health? Or because I want to take more pleasure in my food and my sleep? Or is it because I am eager for such exercises as these, not like the long-distance runners, who develop their legs at the expense of their shoulders, nor like the prize-fighters, who develop their shoulders but become thin-legged, but rather with a view to giving my body a symmetrical development by exercising it in every part? Or are you laughing because I shall not need to hunt up a partner to exercise with, or to strip, old as I am, in a crowd, but shall find a moderate-sized room large enough for me (just as but now this room was large enough for the lad here to get up a sweat in), and because in winter I shall exercise under cover, and when it is very hot, in the shade? Or is this what provokes your laughter, that I have an unduly large paunch and wish to reduce it? Don't you know that just the other day Charmides here caught me dancing early in the morning?" "Indeed I did," said Charmides; "and at first I was dumbfounded and feared that you were going stark mad; but when I heard you say much the same things as you did just now, I myself went home, and although I did not dance, for I had never learned how, I practised shadow-boxing, for I knew how to do that." 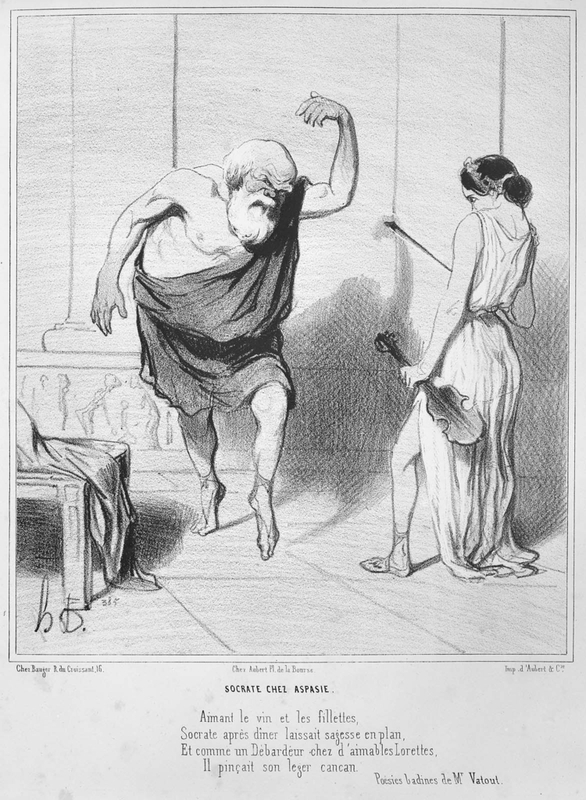 In a detailed analysis of the scene, Bernhard Huss, "The Dancing Socrates and the Laughing Xenophon, or The Other Symposium," American Journal of Philology 120 (1999) 381-409, rpt. in Vivienne J. Gray, ed., Oxford Readings in Classical Studies: Xenophon (Oxford: Oxford University Press, 2010), pp. 257-282, concluded that "Sokrates never danced" (p. 263).